A four-legged robot known as the Cheetah lived up to its name on Monday, setting a new land speed record for legged robots by running at 18 mph (29 kph) on a treadmill at a laboratory in Massachusetts, its developer said. The Cheetah, being developed by Boston Dynamics with funding from the U.S. military's Defense Advanced Research Projects Agency, is part of a program aimed at achieving theoretical and experimental advances in the science of robotics. The Cheetah broke a land speed record for legged robots that was set in 1989 when a two-legged robot at the Massachusetts Institute of Technology ran at a speed of just over 13 mph (21 kph), Boston Dynamics said in a statement. Dr. Alfred Rizzi, chief robotics scientist at Boston Dynamics, said the goal is ultimately to get the Cheetah running much faster and in an outdoors environment. "We designed the treadmill to go over 50 mph (80 kph) but we plan to get off the treadmill and into the field as soon as possible," Rizzi said in a statement. 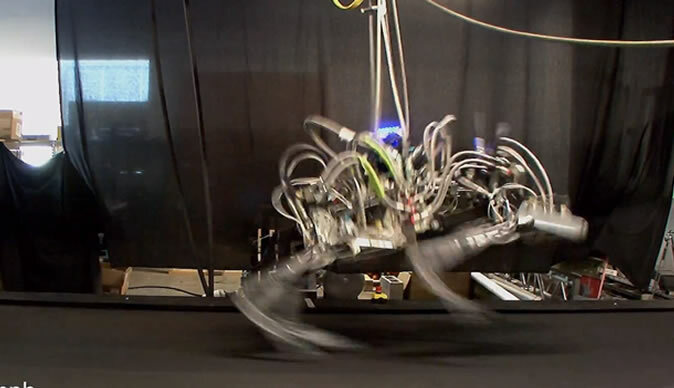 "We really want to understand the limits of what is possible for fast-moving robots."